You're here because you are making a job transition. You need to find opportunities that are aligned with your career goals. You need to get calls for interviews after submitting your resumes online. You need to know how to make your resume jump out of the pile. You need to know how to find the right opportunities and narrow down your prospects so you can focus your time and energy on the right opportunities. You need to shine and confidently talk about yourself in the interview in a compelling way so they make you a job offer. You need to know how to make a decision about what offers to accept and how to negotiate your value. The job search and application process is daunting and overwhelming. How will you manage the process? How will you keep momentum and squash feelings of defeat? We will guide you through all of this and more. 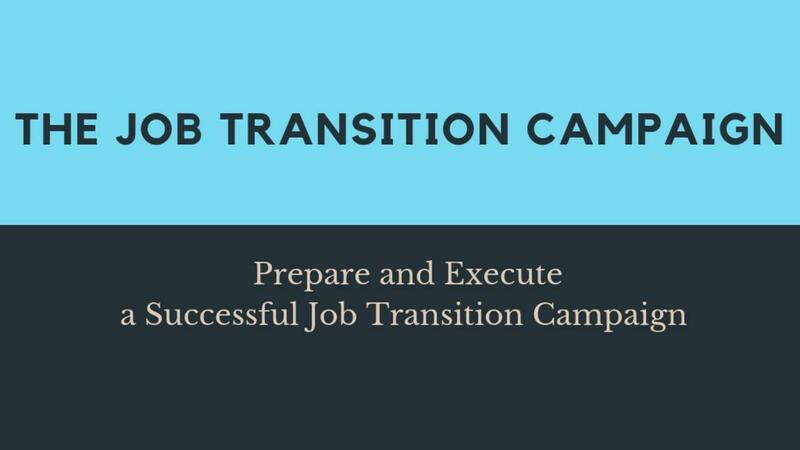 A Guided Self-Paced Job Transition Program that will guide you successfully through job change. Understand what to do when you do not have all of the requirements for the job or you are being rejected from employment. We are here to cheer you on, critique your campaigns, push through obstacles, and make sure that your transition is as simple as it can possibly be while still hitting your career and life goals. You will never run into a problem that we can't deal with. You will never ask us a question that we won't answer. We will look at all of your work - resumes, cover letters, job search campaigns, interviewing strategy, all of it - to make sure that your personal marketing materials are powerful, authentic, and effective. That's what it takes to transform your career. This is why our clients reach their goals and get incredible results. We will guide you step by step and take care of you. All of the help in the world won’t change things if you’re overwhelmed, stressed, and not taking action. That’s why we also include Live Q&A’s, swipe files, templates, inspirations, coaching, and a community support group. It’s also self-paced and you have one full year of access, so you can work on it on your own time and at your own pace. But we will be there to support you and cheer you on inside the classroom and private members-only group. All of your program materials are hosted on a beautiful, private portal, which you can access anytime from your computer, tablet, or mobile phone. This is your new career management basecamp. Once the program begins, you’ll receive guided career coaching, lessons, worksheets, action plans, and accountability to keep you on track. As soon as you join, you’ll be invited into our private online community. This is where you’ll meet like-minded peers and coaches who are ready to transform careers and lives. You will mingle with other high-achieving, well-connected, and thoughtful professionals just like you. Plus, I’ll be coaching you through the entire process, and so will our team. We’ve thought of everything you will need, so you can focus on what really matters: your success. Every module has been tested over and over with our clients (and myself). My clients have landed their dream jobs with prestigious firms, happy workplaces, and started their own companies. Many have left soul-sucking jobs to go on to careers that give them a sense of meaning and personal and professional satisfaction. You will do it too. I know you may be worried that you have no idea how you’re going to get out of the situation you’re in and into a job that makes you happy. I understand; I have been there. And so have the clients who I have been working with over the past 10 years. I know why you’re here and I do not take it lightly. I want you to get results and thrive doing work that pleases you. We’ve got you covered. We don’t just dump you out at the end. After the first few modules, we’ll show you how to start applying your progress to find work that you enjoy, that is aligned with your skills and interests, and make career decisions that serve you well. A convenient online portal where you can access your coaching and program materials on your computer, tablet, or mobile phone. You won’t miss a thing, whether you’re at home, at work, or on the go. Weekly guided career coaching, action checklists and outlines, lessons, custom action plans, and videos. Plus, a detailed guidebook with exercises, swipe files, templates, and more. We’ve done all the planning and organizing for you to save you time. We all need it. I believe in you. I will remind you why and how you are going to do this. Receive recordings, guided-action scripts, productivity hacks, and inspiration. You’ll reduce your fear, doubts, and stress and increase your action and confidence in no time. I will make sure that you keep going with weekly checks-ins and actionable, momentum-building, strategic career guidance and accountability to keep you focused and on track until you reach your goal. I’ll coach you every step of the way in our private community and through video messages and chats. This is the next best thing to having me in the office. A private online community of like-minded, smart, and motivated people—because there’s no reason you should have to do this alone. Connecting with other participants and our team coaches will help you meet your goals. You’ll also have access to our team and me. Ask your questions and get feedback. We even have regular office hours so you can get undivided attention—that alone can easily cost over $350 per session. Who is The Job Transition Campaign right for? NOTE: These are all perfectly human responses to life pain but they require a different intervention at this time. After just one module, people start seeing themselves in a new light. They gain clarity, focus, and direction. They have renewed energy and hope about the future. They are inspired and motivated to make changes. You will receive a number of tools, techniques, and strategies that can help you significantly when you put them into practice. We will work with you and support you to make sure you achieve outcomes. You will never be alone. You’ll have a full year of access. That way you can do it on your own and experience the benefits again and again, whenever you need a boost or a reset. If you have participated in the weekly meetings and completed prescribed exercises and have not achieved results at the end of the program, we insist on extending your program and continuing to work with you. Enroll now and I’ll see you in the program! Registration is only open for a few weeks, and then we close it down so we can prep and start the program. This program will not be available again until April 2019, so if you want to start working on transforming your career before the end of the year—get on the list. The time is now. So, are you ready to feel better about your work and life? Are you ready to do better—at home and at work? Still fence riding? You can do this. What actions and career goals do you keep putting off? What do you want to achieve in the months ahead? Who do you see yourself becoming in the years ahead? You have an opportunity to take action and create a successful and fulfilling life and career you dream about. And if not now, when? So, let's make today the day that completely changes your career and life forever. I know it’s not always easy. If it was, you would have done it by now. I have created the system to guide you step by step through the process and if you are committed to this program, I will commit to you. My promise is that if you join The Job Transition program and give it your best effort, I will be your champion and will not let you get in your way. I want you to experience career peace and success and renewed vitality. I want people to run into you on the street and ask what you're doing and to have you respond with joy because you are so happy. And, I want you to lead by example and show other people what is possible in their own careers and lives. Achieving your best isn’t something you can outsource. It’s a reality you create—one good choice at a time. Enroll now and I’ll see you in the program.